In this growing technology, we are surrounded by the electronic gadgets and we can control almost everything from our smartphone. As most of the electronic items are connected to wifi and internet, we can control them by our mobile with the help of Best Universal Remote App. So, today here I’m going to Share 10 Best Universal Remote App For Android & iOS. If you are a tech geek, then you might be looking for how to control AC with mobile phone or TV with a mobile phone. So, in this Article, you’ll find how to turn your android phone into a universal remote? As technology is growing faster, Smartphone has taken a new look with cool features like Finger Print Scanner, Dual Camera and IR Blaster. IR Blaster is the new technology using which you can access any electronic items in your house. Simply, you have to download IR Blaster App or Remote Control App For Android & iOS. When it comes to control tv from app, you can not only control TV but you can also Control other electronic items like AC, Fan, Projector, Camera, etc. You can also Control PC with some of the Remote App. Apart from normal Android TV Box Remote App, there are also Programmable Remote Control App which you can use to customize your Remote and access most of the electronic gadgets. There are many Infrared Remote Control App available on Play Store & Play Store Alternative but selecting the right out them is quite necessary. So, here I’ve listed the Top 10 Best Universal Remote App For Android & iOS. SURE Universal Smart TV Remote Control is one of the most popular and Best Universal Remote Control App For Android & iOS. The App has over one million IR appliances which means you can control over one million devices with this App. The App works with Wifi control for smart devices and IR Blaster for traditional devices. It also has support for Amazon Alexa. Moreover, it has inbuilt Music Player and Video Player to browse your music and Play it on the App. Peel Smart Remote is another Best Free Universal Remote App For Android & iOS which uses IR Blaster to Control Electronic Appliances at your home. It’s a Universal TV Remote App using which you can Control TV, Air Conditioners, Fan, DSLR Cameras, Projector, DVD Player and much more. With Peel Universal Remote, you can easily set a calendar reminder which works as Alarm Clock. Also, it’s pretty easy to use and set up. AnyMote Universal Remote is another Best Android Universal Remote Control App through which you can use Android phone as TV Remote. The App has support for over 900,000 devices. Apart from TV’s, you can also control other gadgets like DSLR Cameras, AC, Projector, Fan, etc. Additionally, you can also Change Theme according to your needs and you can use most of the commands in just one tap. Unified Remote App is a unique App which comes with tons of features in it. It is another popular and Best Universal TV Remote Control App For iOS & Android. The App is also supported on Windows, Mac & Linux. Apart from electronic items, you can also Control computer from Android by Converting your phone into Keyboard & Mouse. On the Main Screen you will find options like Basic Inputs, File Manager, Keyboard, Power, etc. Additionally, the App has Remote Controls for over 70+ Applications. Roku App is great for Roku owners and it’s available for both Android as well as iOS. With the help of this App, you can see videos, images, music on big screens. The App lets you control almost everything on the Roku. The Remote comes with a Play/Pause, Rewind, Fast Forward, Home and Navigation button. Also, you can Stream more than 500 channels on it and make sure to connect your mobile/tablet on the same network. When it comes to the Default & Best Universal Remote Control For TV, Mi Remote comes into the list. It is the Default TV Remote App which comes pre-installed on Xiaomi Phones. It is one of the Best TV Remote Control App using which you can control most of the smart gadgets like TV, AC, DSLR Camera, Projector, DVD Player, etc. Apart from Xiaomi Phones, you can also use this Mi Universal Remote Control App on other Phones as it’s freely available on Google Play Store. Yatse, another Mobile Remote Control App which can control your smart devices easily. With this App, you can easily play on the local device, Roku, Chromecast, etc. You can control this app from your Lock Screen, Widgets, Watch and Notification. With this App, you can control everything with ease. Additionally, you’ll be able to change themes, colors, list layouts and much more. You can say, it’s an All In One Remote Control App. 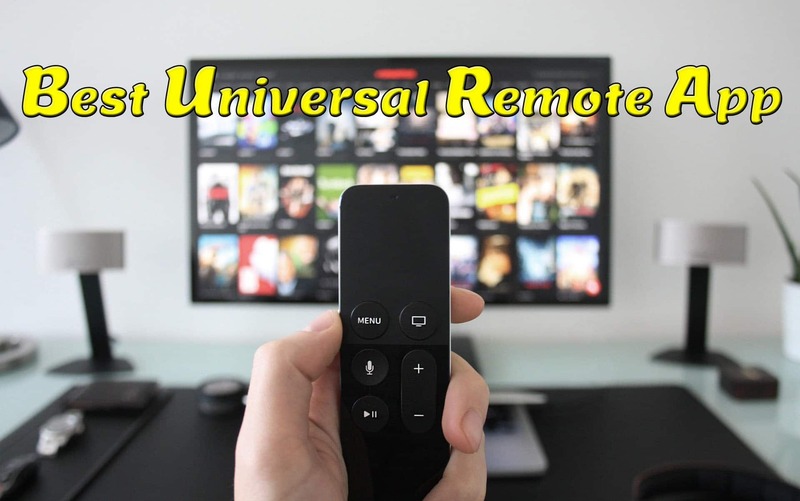 Universal TV Remote is a free and easy to use Remote App using which you can control different gadgets with your phone’s IR Blaster. This Remote Control App has many functionality buttons like Volume Up and Down Button, Arrow Button, Mute Button, On/Off Button, Menu Button and Number Keys. With this Universal App, you can control most of the gadgets with different brands. Also, you can change color on this App according to your choice. ZaZa Remote is another Universal Remote App which can control your household appliances and it works on built-in IR Blaster on your Smartphone. The App has huge Remote Control code library which contains over 300,000+ appliance covering the global 8000+ appliance brands. This App supports Remote Control TV, Air Conditioner, Set-top Box, Projector, Camera, DVD Player, Power Amplifier, Fan and much more. Overall, it’s the Best Remote Control App for your Smartphone. Who doesn’t Know Google Home? It is another popular and Best Android Remote Control App for your Smartphone which can work as Remote Control. Its primary function is to control Google Chromecast Devices and Google Home. Though the App is free, Google Home and Chromecast Devices do charge money. Simply, Connect your device with Google Home or Chromecast and it will work as Remote Control. You can change the channel, increase volume, decrease volume, etc. This was the Article On 10 Best Universal Remote App For Android & iOS. Apart from this, there are many other Universal Remotes For Android and iOS but here I’ve shared best out of them. These are for non smart tv remote app as well as for Smart TVs. With these Smart Remote Apps, you can easily control most of the appliances at your home using your Smartphone. Hope you liked this Article On Best Universal Remote App. Do Comment below if you know any other Best Remote Universal App. Stay tuned with us for more latest Tricks & Updates.